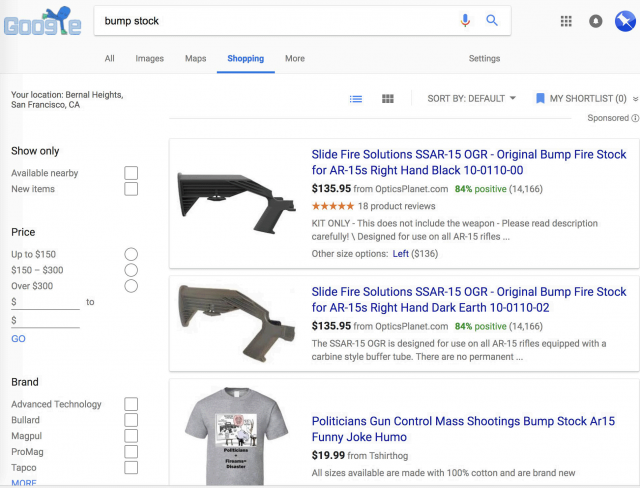 There has recently been a lot of talk around bump stocks since the Florida shooting, and even well before it, mostly about how the government has been dragging their feet in not blocking the sale of such devices. Bump stocks are used to make a semi-automatic rifle to mimic a fully automatic weapon. The other day, if you did a search for [bump stock] in Google shopping, you were actually able to buy them. I was not able to replicate back then, nor am I now but it was confirmed to be an issue not just by the searcher but by Google's very own Danny Sullivan. This is likely in violation of our ad policies: https://t.co/OeDEo3oflK -- I've passed this on for review. I still see them too. I do know people are reviewing this right now, however. I am not sure how these snuck through, but I personally do not see them anymore. I am glad Google does take these seriously and removes stuff from their search results which are against their policies.